RestlessOasis: Layered Rugs, Yes or No? Layered Rugs, Yes or No? My friend B and her husband are in the process of buying a house, and we have been talking about ideas for her new home. The subject of rugs and layering of rugs came up, and it got me thinking. What are your guys thoughts on this subject? My personal take is this: I don't mind layering rugs on wall-to-wall carpet as long as it's a very low pile carpet. 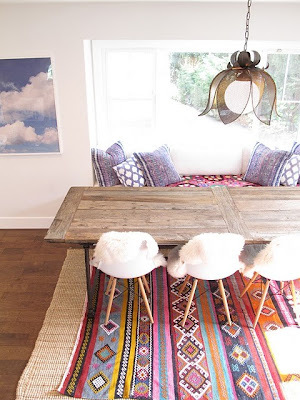 I do, however, like the layered rug look- especially when the bottom rug is a jute rug. Here are pictures for you readers who are visual like myself. What do you guys think? Definitely YES. My favorite is the third picture-very cute! I actually like all of these pictures because the pattern of the rugs adds something to the room but are balanced out by the more neutral underlaying rug. There- that's my opinion :). The third is my favorite as well......it's from one of my favorite blogs AmberInteriors. You should check it out, she is amazing!